If you have been learning how to sew and want a fun sewing project to practice stitching straight seams, this Quilting Tutorial for Beginners: Super SIMPLE Squares Quilt Tutorial is the perfect project! 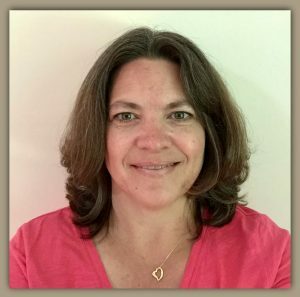 When I am learning a new skill, I like to have some introductory information to help me see the bigger picture. 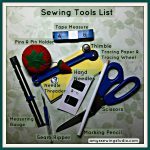 Yes, quilting is just sewing but there are a few things I wanted to share with you. Quilting is the actual joining together layers of fabric and padding with lines of stitching to form a bed covering, warm garment or a decorative effect. The actual bed covering or wall hanging is called a quilt. There are many different ways you can come up with quilt designs. Some quilters use templates to cut out cool shapes of fabric, some quilters cut simple shapes like rectangles and squares and some quilters even just start sewing pieces of fabric together without any planning at all, this is called a crazy quilt! There is no right or wrong way to design a quilt. You can have many shapes, colors, patterns…the possibilities are endless! 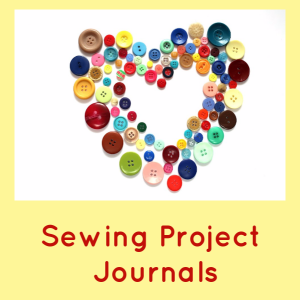 You can use a quilt pattern book or you can design your own quilt. When the quilt top consists of multiple pieces of fabric sewn together, it is called Patchwork Quilting. 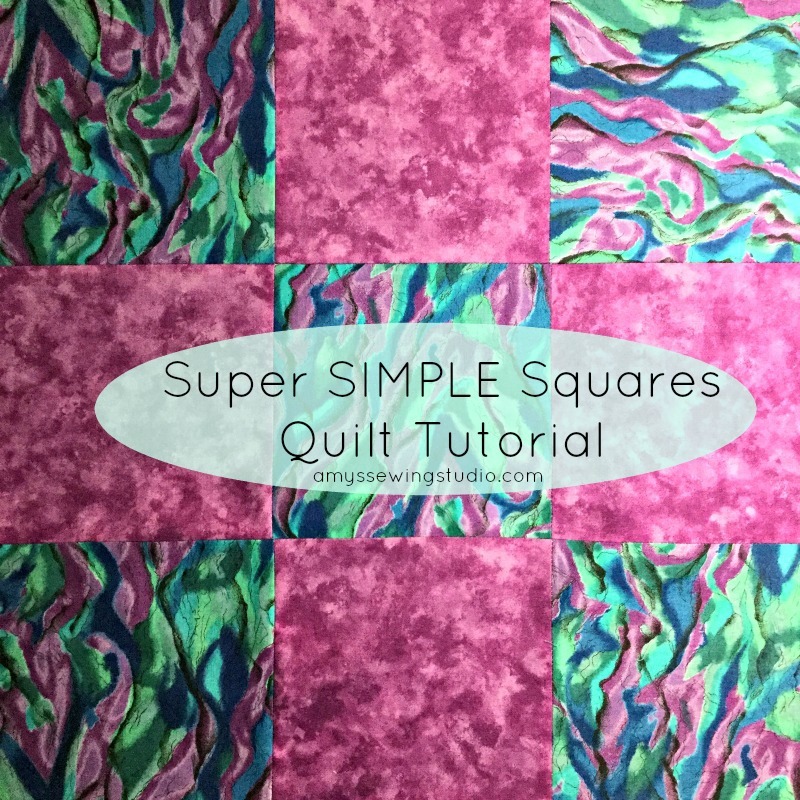 In this Quilting Tutorial for Beginners, I’m going to show you how easy it is to make a Super SIMPLE Squares Quilt. **If you choose to use my design (shown below), you will need 1 1/3 yards for the BLUE shaded squares, and 1 1/3 yards for the GREEN shaded squares, AND 1 3/4 yards for the PURPLE shaded squares. Use whatever fabric colors you want in place of my blue, green, and purple; just make note of which fabric you are using to correspond with my color shades to make sure you purchase the correct fabric yardage. Backing/Self Binding- Use a fabric for the back that is bigger than the quilt top. Measure finished quilt top and add 8″ to the width measurement and 8″ to length measurement. This will be the size of your quilt back. You need extra fabric to allow for some ‘shrinkage’ that happens to the backing fabric when you quilt your layers of fabric. You will then straighten out the fabric edges and have enough left on the sides to do a self binding. This size of batting will most likely be bigger that your quilt top, that is what you want! 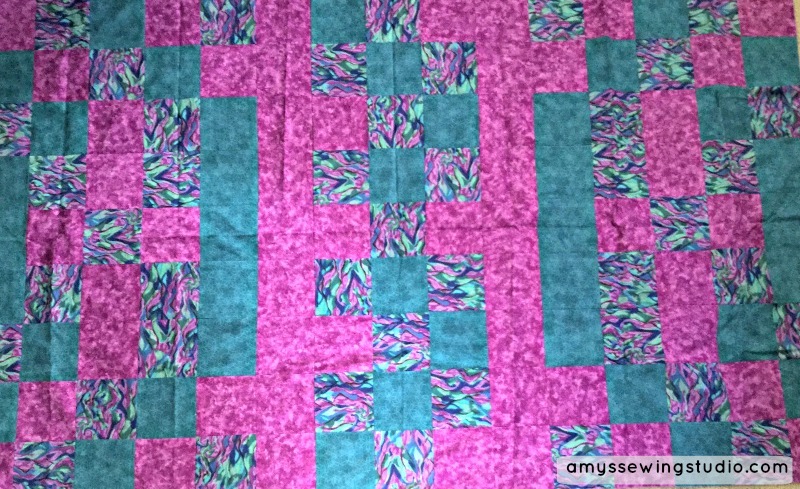 When you do the actual quilting of the layers, the batting will have some ‘shrinkage’ from quilting and you don’t want to be short on any of your edges. After the quilting is complete you will trim the batting to match the edges of your quilt top. Thread– A very light grey color works good for sewing seams. 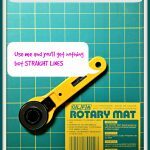 Rotary Cutter, Mat, and a clear plastic ruler are extra helpful! Rotary Cutters have blades that are very sharp and you should use a Mat under your fabric when using a Rotary Cutter to protect your furniture. I chose to make a super simple lap quilt to have for when I’m hanging out on the couch relaxing. I used fabric that I had received from my mom, she obviously had some sort of quilt planned! The whole idea for this post is to show you HOW to make a simple squares quilt. I’ll show you the design I made with the 6″ fabric squares I had and the approximate amount of fabric you’ll need with three fabric choices like I have. If you choose to use a different design and more or less than three colors of fabric, you’ll have to do a little bit of easy math to figure out how much fabric you’ll need. ONE MORE THING: MAKE SURE TO PRE-WASH YOUR FABRIC before cutting your squares. You don’t want to be surprised when your quilt ends of being smaller than you originally planned for if you don’t pre-wash! My quilt is 9 squares wide by 15 squares long. 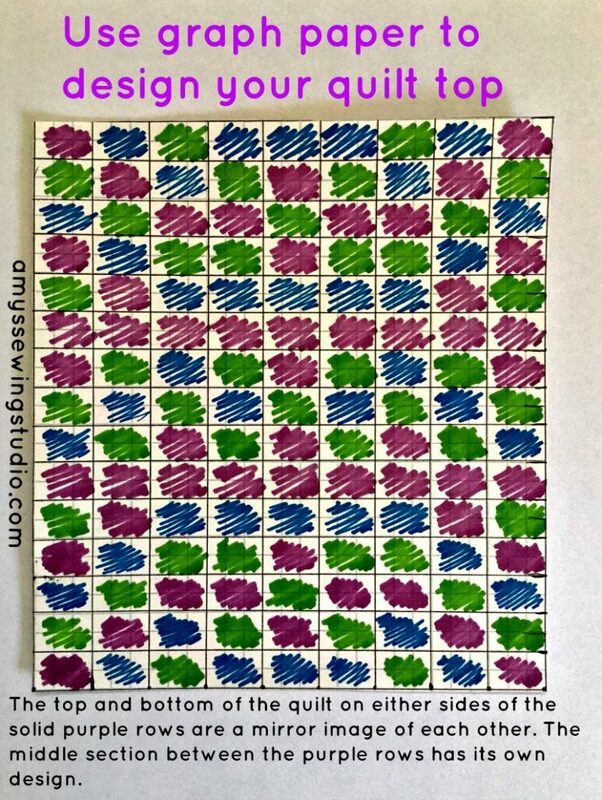 A total of 135 squares. I laid out all the fabric squares to come up with the design I wanted for my super simple squares quilt. I then used a piece of graph paper and some colored pens or pencils to draw the picture of my design to have as a reference while I’m sewing the squares together. You can use the same pattern I have shown below OR draw your own. Actual quilt top as shown on design paper, except in this photo the design is laying horizontal instead of vertical like the paper design. For this Quilting Tutorial for Beginners, we are going to be using a simple square shape of fabric. If you are following my pattern, you will cut 6″ X 6″ squares. A clear ruler, cutting mat and rotary blade can help to save time by layering three to four fabrics on top of each other for measuring and then cut the fabric with a rotary cutter. 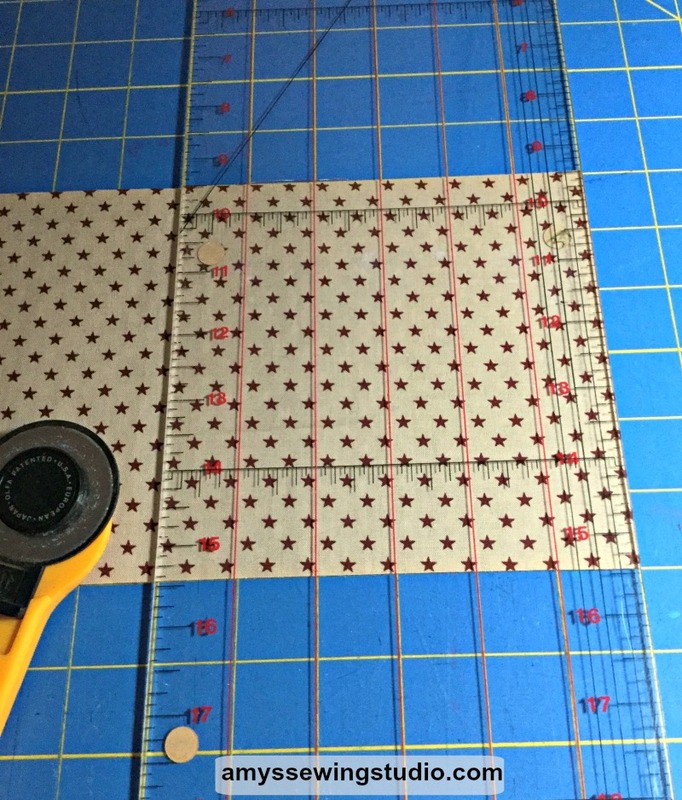 Measuring and cutting fabric with a clear ruler, mat and rotary cutter. The seam allowance for making quilts is 1/4″, and this is the seam allowance you will use to sew your fabric squares together. IT IS NOT NECESSARY TO BACKSTITCH THE SEAMS when constructing the quilt top because all the seams will have other stitching sewn over them when you sew all the rows together and also when the outside edges of the quilt are finished. 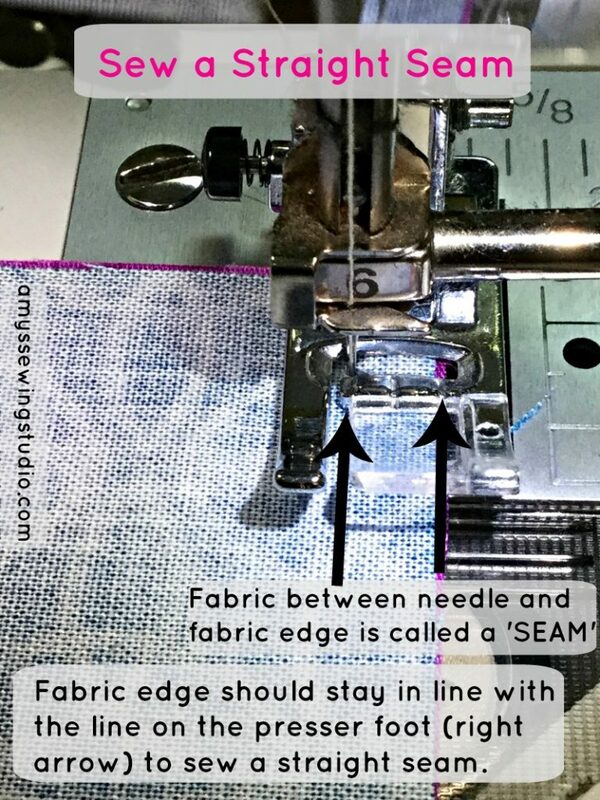 Use 1/4″ seam for making quilts. This picture shows 1/4 inch between the needle and the line on the presser foot. 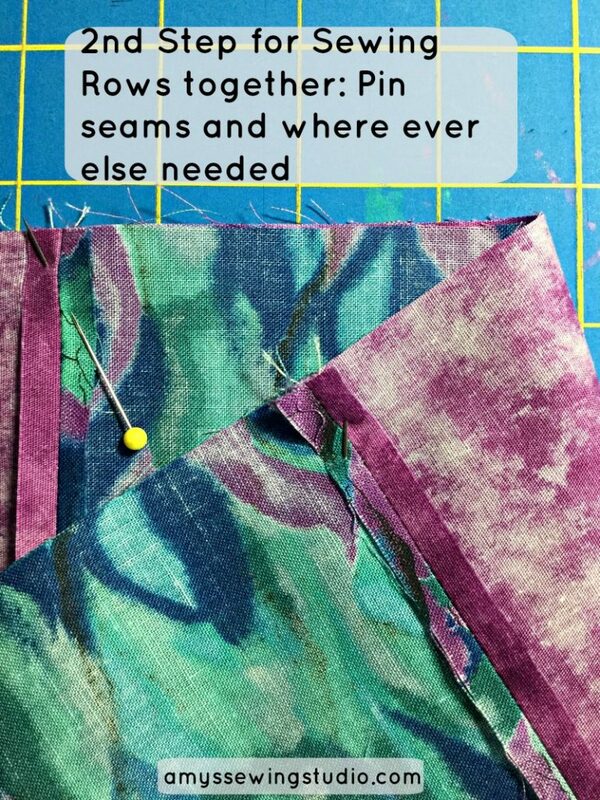 1) Starting with the top row in the design-place your first square and second square of fabric right sides together and stitch a 1/4 inch seam. 2) Open up these first two squares and place the third square on top of the second square right sides together and stitch. 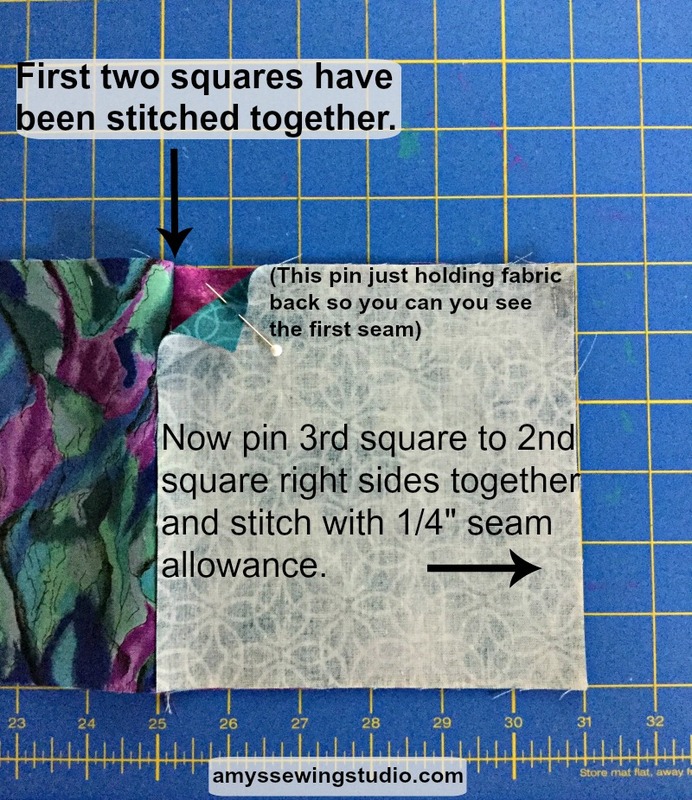 (I am right handed so my seams will always be on the right side of the squares) If you find you accidentally stitched a square in the wrong order, according to the design, use your seam ripper to take out the stitching and re-stitch the correct square in place. 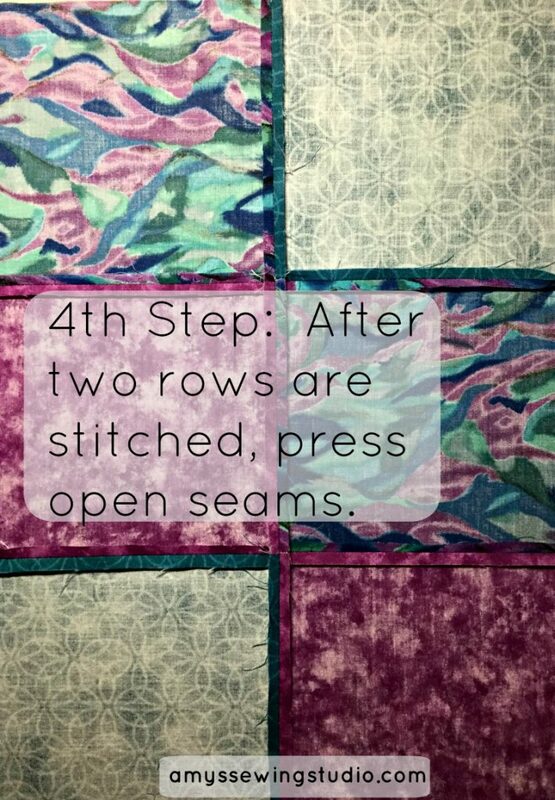 Continue stitching squares until your first row is complete. Continue stitching each row, until all rows are complete. Lightly press the seams open down the middle of the seam on all the stitched squares. Place the first row of squares to the second row of squares right sides together matching centers of seams as you pin. 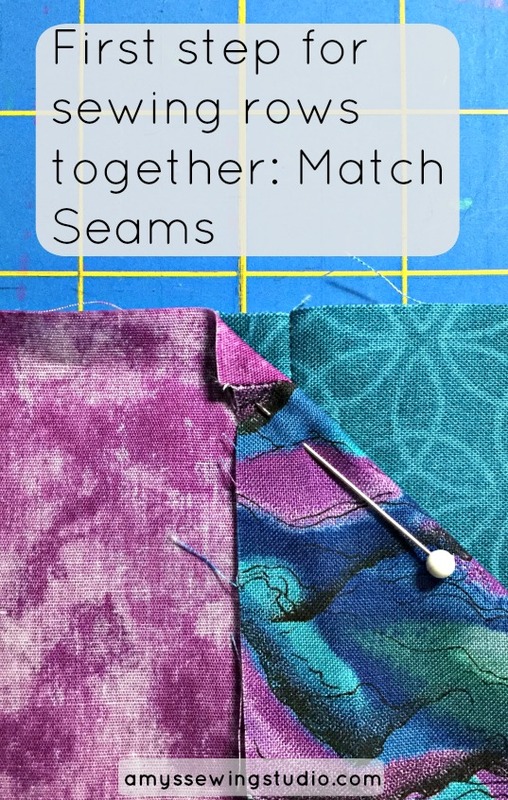 If you are having trouble matching seams exactly, the reason may be the seam allowances are not all at 1/4″. No worries! Just match as best as you can starting in the center of the row and then pin out to the sides. This is beginning quilting and NO PERFECTION expected! 3rd Step: Stitch a 1/4 inch seam where you just pinned-take out pins as to NOT stitch over them. 4th Step: After rows are stitched together, press open seams. Continue sewing rows together according to the quilt top design. Double check to make sure you have each row pinned as shown in the design as to minimize using the seam ripper. 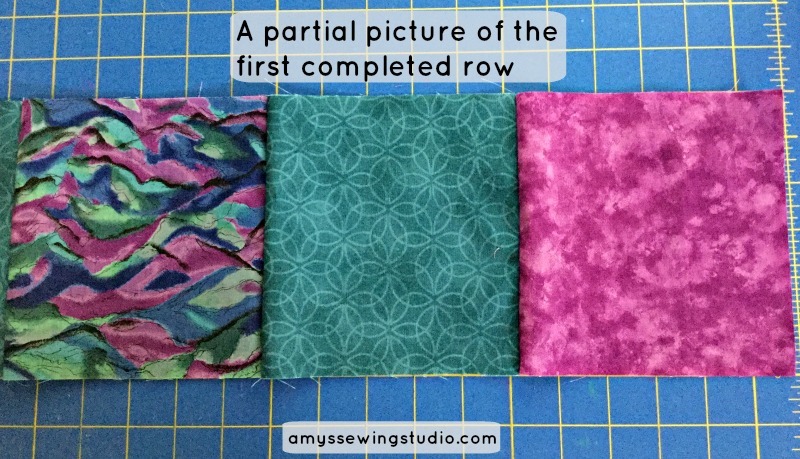 Congratulations, the rows are all sewn together and pressed; now you have a quilt top! Please check out my Casserole Carrier Tutorial for help on layering this quilt and sewing together. (Pinning the batting/backing fabric and figuring out the actual quilting design) The only difference is you won’t be using insul-bright. The general directions are the same. There are many different choices to use for the ‘middle part of the quilt’. You can use cotton batting, polyester batting, or you could even use fleece. For this quilt, I will be using a polyester batting with a 1/4″ loft (thickness). I found a package of this at a garage sale, so why not! 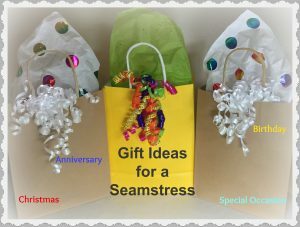 I have used cotton batting and fleece before and these are my two favorite choices if I were to go make a purchase in the store or online. You can make several different quilts and experiment with different batting types to see which one you like the best. 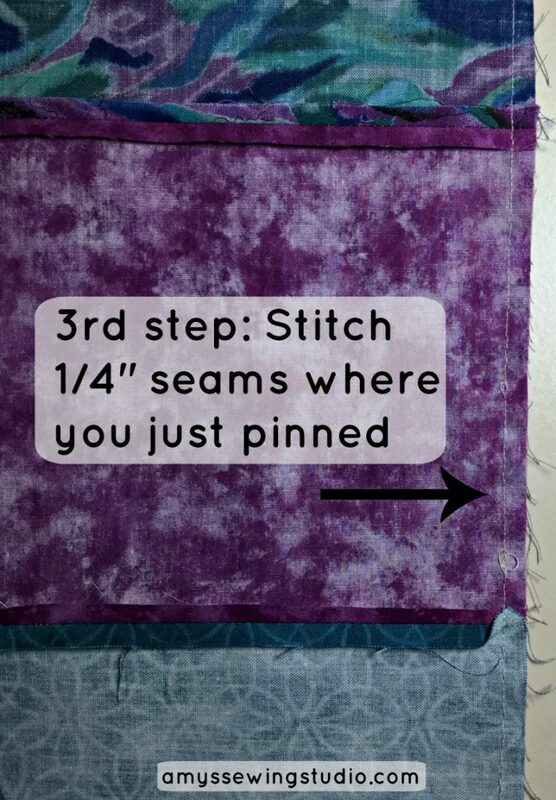 The easiest stitching to do is to ‘stitch in the ditch’ which is using your seam lines for the quilting pattern. You would just stitch thru all layers (top of quilt, batting, back fabric piece) in the seam lines from the quilt top construction. You could stitch only the columns, or only the rows, or both. The quilt design is up to you!